Taking a cue from its Broadway peers, Florida Gulf Coast University’s Theatre Department has gone green. It all began in 2008 when “Wicked,” a show starring a green-faced witch, sparked a nationwide movement to make the notoriously wasteful theatre industry more sustainable, says Anne Carncross, FGCU associate professor of theatre and technical director. The Broadway Green Alliance (BGA) launched, motivating the theatre community to become more environmentally friendly. Enter the Green Captain program. By 2013, every Broadway and touring show was on board with a Green Captain in place. That same year, the BGA started the College Green Captain program, and vibrant partnerships with colleges and universities have been forming ever since. It’s a natural fit for FGCU, which defines itself as a sustainable university. She believes the same philosophy should extend to theatre. Carncross knows that it isn’t a natural practice in the theatre world. What does the Green Captain do? “The theatre is notorious for the use and waste of paper, lumber, fabric, electricity and many of the same things that we all use daily, such as batteries, lights, plastics and cleaning agents,” Deutch says. Deutch point out that FGCU has updated the theatre’s entire lighting and dimmer system. Enhanced safety is another benefit. “The LED lighting produces very little heat when in operation. This makes it easier for students to focus the lighting without worrying about burning their hands. 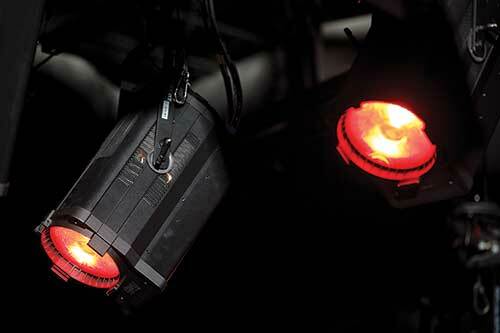 Standard lighting instruments can cause first-degree burns if handled improperly,” she says. It also results in lower air conditioning costs, says Carncross, because the lights run cooler. Every show uses scenery to create locations. 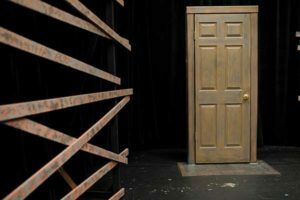 Sets are built using a variety of materials and in the new, green world of theatre, the goal is to use materials that may be re-purposed and used in multiple shows. That’s a far cry from the days when everything was discarded. These days, Deutch and Carncross say, they save between 45 percent and 90 percent of the materials from each show. It’s not easy to do, especially considering that you have to anticipate the needs of shows that could be a year or more in the future. Nonetheless, it’s worth the effort and given the FGCU philosophy, everyone embraces it. “It’s an easy sell,” Deutch says. “Water Stories,” a collection of short pieces about the beauty, power and danger of water, told through theatre, music and movement, will make its world premiere at FGCU in the fall. It is a collaborative work by members of the FGCU theatre and music departments. 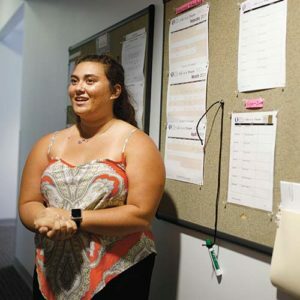 It includes students in the Creating New Theatre course, taught by Associate Professor Gerritt VanderMeer, in collaboration with music theory and composition Assistant Professor Jason Bahr and students from the FGCU Composers Guild. The project provides a showcase for undergraduate students as creative scholars and theatre artists who will have spent about 10 months researching and developing the works then rehearsing and performing them. These works are particularly relevant to FGCU and Southwest Florida as the university prepares to launch The Water School and the region grapples with so many issues involving water. The stories will also explore the roles water plays in mythology, folklore and fairy tales and will incorporate a variety of theatrical ways in which water is represented on stage through lighting, music, dance, scenery, stagecraft and sound. “Water Stories” will have its world premiere Dec. 8-11 as part of the FGCU TheatreLab’s 2019-20 Mainstage Season. More information will be available once the new season is announced at fgcu.edu/cas/bsma.